RDS Shaft Speed instruments are an easy to use and cost-effective tool for monitoring up to six different shafts at the same time. The Shaftspeed series also offers internal audible alarms to alert the operator to drops in performance or malfunctions of the machine. 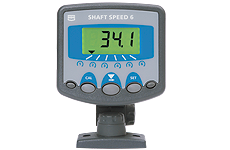 To see the Advantages and Features of the Shaftspeed series, click on the tab on the right to view the data sheet.